Gurus Chengannur Thangachan, Ammapettai Krishnamurthy, Ramamurthy Rao(Hindustani) and all other Maanaseeka Gurus who inspire me to do quality work. Happiest Moment When my song Nirpadhuvae from Bharathi was declared a super hit and the subsequent state award from Ex .Chief Minister J.Jayalalitha Avl. Director Ram Gopal Varma,Anurag Kashyap,Bharathi Raja, Sridhar, K.Balachandar, Cheran,Kamal hassan, Alejandro Gonzalez Innaritu, James Cameron,Mel Gibson, Sekar Kammula,Priyadarshan,Sibi malayil,Srinivasan, Girish Kasaravalli and many others. Friend Anand Vasudevan, Karthik Nagarajan(Baba) and many others..
Leader Many great leaders especially Dr.Abdul Kalam,Nelson Mandela and Al Gore. Your experience while performing in foreign countries 1)Music is relished as music in foreign countries more than the star value tag associated with it. 2)The love for Tamil is more outside India than here. 3)The respect and love for musicians is amazing especially in Srilanka and in countries where srilankan tamils live. 4)The local artistes are all part timers unlike the scenario in India where we are all fulltimers. Is anyone from your family into music My dad was a musician himself, my cousin Palladam Ravi is a leading Mridangam artiste. Would you be able to write a book based on your experiences Maybe in the future. Yes. About your Fans/ Followers They are everything to artistes. Your experience about being in Orkut / Facebook Orkut and Facebook helped me make many friends, find lost contacts and interact with fans.But some cyber criminals, hackers and stalkers create fake profiles,clone profiles etc and cause trouble.So I am doubly cautious with these sites. First stage performance At a Tutorial college annual day function when I was 8. I sang Bharathiyar Song "Manadhil Urudhi Vaendum" sung by KJ Yesudoss. First opportunity I sang in Ayudha pooja function organised by some autorickshaw drivers of our area. First Salary Rs.2000 for a Telugu song. What did you feel/experience when your first song got released I was very happy and went to Mr.Vidyasagar's house to thank him for the opportunity. I was told that he was in Vijaya Garden studio.I went there to thank him and also thanked my director R.K.Selvamani at his office. What did you feel/ experience when you listened to your song sitting along with the audience When my first song "Vaasaki" was released, I went to the Cinema hall with family.When the song was played I was looking into the faces of other audiences to see if they like it or dislike it. I also was wonderin if my voice suited the great actor Mammootty. Your experience when you sang your song in the stage I sang this song in some function in which Vidyasagars band performed.It was wonderful and a proud moment to perform in front of the composer himself. The thing/vehicle /house you bought after getting your first salary I gave it to my parents.Did not spend from it. Most unforgettable experience that happened during the recording Ae Azhagiya Theeyae song was recorded three times with different lyrics and scales.I was stuck with anxiety. 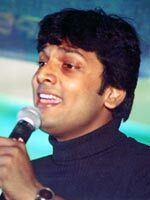 Harris Jayaraj really encouraged me and motivated to sing again. Finally it was a block buster hit. Your feel when others sing your song It is mutual.Nowadays everyone has to sing each others songs. Your experience while being along with the orchestra It is a pleasureable experience.There is a unique feeling when we sing live despite so much of recorded music is available everywhere. How do you safeguard your voice while performing in cold places/countries I do self healing and avoid frozen foods . Your opinion on the present music industry It is really good as there are lots of talented directors, music directors ,singers, cinematographers are all coming up. Your suggestions/advice for upcoming singers ,music directors and lyricists Playback singing , in my opinion is not a full time profession anymore. Have it as a part time but love the work you do. Also please dont make false claims and try to take false credits for the songs sung by others as yours(I see this happen nowadays). Lies cannot take us far.. Your experience with your voice modulation We have to customize our voice to suit every song depending on the demands of it. The thing you are not able to understand in the film industry The fact that Tamil music industry is dominated by singers who do not know Tamil and mispronounce the language is really sad. They get paid manifold than the South Indians .I am unable to understand why the locals are belittled in our industry. I dont think this would happen in any other film industry around the globe. Your opinion about remix Remix is a new dimension. I love some and dont like some.It depends on the craftsmanship of the person who remixes it without damaging the original song.